Uptake of biosimilars, i.e. cost saving highly similar versions of the stiff price reference biologic products, has been slow throughout most of Europe and the rest of the world. Biologics, i.e. medicines that are engineered from living cells, are dominating the pharmaceutical market, with 9 out of the 10 top-selling medicines being biologic, and accounting for $70.2 billion in revenue. (Brown, 2016, p. 5) Being complex to manufacture, and being subject to arbitrary price gouging, the prices of biologics are very high and are beyond the reach of a majority of patients. However, the market is now facing the first biologics patent cliff, with many biosimilars now entering, resulting in the opportunity for governments worldwide to make real cost savings. However, uptake of biosimilars, i.e. highly similar versions of the reference biologic product, has been slow throughout most of Europe and the rest of the world. On 23-24th March 2017, I attended the 15th Biosimilar Medicines Conference in London, in order to better understand the current biosimilars market, and to help elucidate questions I had about slow uptake. A couple of presentations were of particular interest. Infliximab, a highly effective monoclonal antibody targeting Crohn’s disease, ulcerative colitis, and rheumatoid arthritis, among other conditions, costs up to £420 per vial, and since treatment dose is dependent on weight, a singe dose of treatment for someone weighing 73kg, for example, would cost £1680 (Robertson, 2015), with approximately 8 doses needed annually. White (2016) reports that use of biosimilar infliximab cuts the course of an annual course of treatment from £10,000 down by half, resulting in substantial cost savings for governments. Doctors elsewhere, including many middle-income countries where disease burdens are increasingly mirroring that of developed countries, have been suspect of biosimilars substitution, on unfounded grounds that they have reduced safety and efficacy. This is contrary to all recent evidence and developments in Europe, where European medicines authorities have reacted positively to biosimilar medicines interchangeability (Baumgärtel, 2017). In addition to Norway, in Denmark, as related by a conference participant, biosimilar infliximab has wiped out originator infliximab, and 50% more patients are being treated. So how do governments encourage doctors to substitute reference biologics with biosimilars? 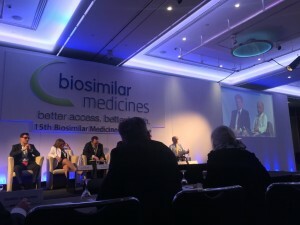 According to an earlier presentation at the conference by Per Troein from Quintiles IMS, “Biosimilars uptake is highly dependent on government proactivity in encouraging hospitals and physicians to substitute.” That is to say, without express and official government policy purchasing and recommending biosimilars, they will not use biosimilars and the resulting cost savings cannot be made. The entry of biosimilars, including the projected entry of Roche’s Ocrevus (multiple sclerosis) and Sanofi’s Dupilumab (atopic dermatitis) in 2017 (Brown, 2016, p. 8), is bound to result in a corresponding response in terms of maximalist intellectual property. Proponents contend that market exclusivity periods for reference biologics are too short, as even if the pioneer biologic retains substantial market share after biosimilar entry, that biologic would fail to recover the average costs of development, manufacturing, promotion, and the cost of capita. (Grabowski et al., 2011, p. 15) The U.S. Federal Trade Commission has disagreed with the contention that patents provide insufficient protection, contending that biologics are covered by varied, and more complex, patents. These considerations are relevant for governments considering the way forward in the Trans-Pacific Partnership, which contains 5 or 8 years of market exclusivity for biologics as a minimum standard. Also interesting during the conference were discussions around narrow bolar exemptions as a barrier to biosimilar medicines entry in Europe. Broader bolar exemptions ensure that experimentation and clinical trials conducted in the private domain towards the production of biosimilars can occur. As countries get richer, disease burdens in developing nations mimic and morph closer to those of developed nations, and at the same time that they set aside misconceptions and embrace biosimilars as have some European countries, they will be expected to embrace maximalist intellectual property tailored towards extending the monopolies of biologic medicines. And while the countries themselves may be rich per World Bank standards, this does not reflect purchasing power, nor does it necessarily reflect the strains on health budgets. Only time will tell how developing countries and emerging markets respond to these countervailing interests, but in any case will serve to illuminate and elucidate the mechanics of the new pharmaceutical political economy and its impact on access to medicines. *Fifa Rahman, MHL (Health Law) is pursuing a PhD in Law examining political economy tradeoffs to intellectual property demands in trade agreements, in the context of access to biosimilars. She is contactable at f.rahman1@leeds.ac.uk. Previous Previous post: Is There a Fair and Equitable Access to Safe Blood Transfusion Products in the World?